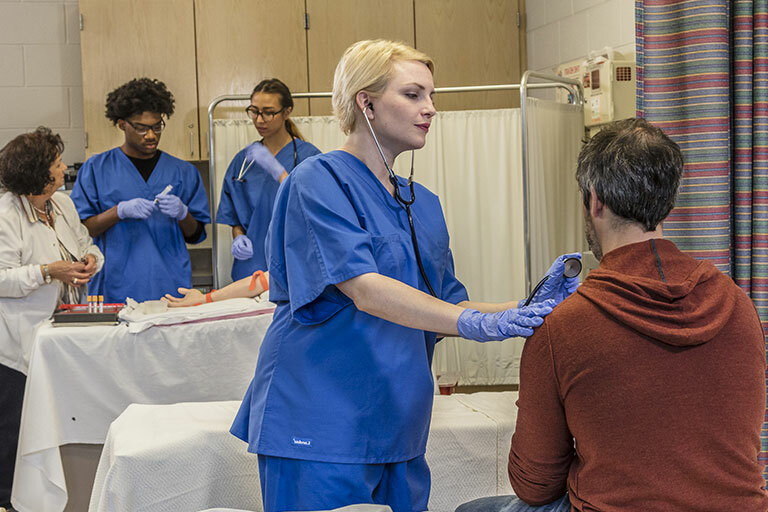 The Health Science Technology (HST) program uses an interdisciplinary approach to health care education with a balance of academic and technical courses to prepare students to serve as practitioners in the health care industry. The curriculum serves three main purposes including 1) completion of prerequisite courses relevant to nearly all allied health and nursing programs; 2) completion of the AAS degree, as well as three or more certificates in health care disciplines; and 3) provides a multidisciplinary alternative to the current health program inventory. The HST program requires the completion of certificates within the health care field, which may be earned while completing the academic courses required. These certificates will afford the student an opportunity to seek employment within the health care field while completing the HST degree. The certificates, which are chosen by the student from MCC s health care inventory based on personal interest, serve as career choice enhancements that may lead to entrance in a specific field of study, or given the student flexibility in choosing varying health care institutions in which to work. Specific certificates will be available on a rotating basis at the Muhlenberg Campus, the Madisonville North Campus, and/or Health Science Campus. Some certificate course work is available online and varies based on the certificate. *Some of the certificates require outside testing and state and/or national certification. Medical careers are very portable. Jobs may be found throughout the country. You can work in places like doctor's offices, assisted living facilities, clinics, the health department, hospitals, laboratories, or pharmacies. Students can come out of the program employable, or choose to complete additional education at the bachelor or masters level, where more focused opportunities will become available. The certificates required for HST AAS degree completion prepares students for a variety of employment opportunities within the health care field and settings such as hospitals, physician s offices, long term care residences, ambulance services, and most facilities delivering health care services. Certificate(s) earned at another college may be approved. General education courses (25-29 credits). Technical Core courses (6-9 credits). Health Science Technical courses resulting in a minimum of three certificate credentials (29-30 credits). GPA of 2.0 or better. Residency requirement (25% of degree at institution granting degree). All exit exams and/or surveys. All payments and fees in full. 100% of Spring 2015 graduates indicated satisfaction on the Program Satisfaction Survey. 99% of Spring 2014 graduates indicated satisfaction on the Program Satisfaction Survey. 100% of Spring 2013 graduates indicated satisfaction on the Program Satisfaction Survey.